An interaction with Chef Madhumita Mohanta, Executive Chef, Lalit Great Eastern, Kolkata. 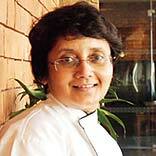 Chef Madhumita Mohanta has travelled across countries and cooked for many international celebrities. While talking to Restaurant India, she explains how she incorporates her skill when cooking for people around the world. How do you find Indian food business different from Singapore, Bahrain and Kuwait? In Middle East and Singapore the average spending capacity is more which directly affect the quality and availability of ingredients. People are more adventurous in terms of trying new cuisine and ingredients. As a chef, it is a great opportunity to experiment with new things as the scope of learning is enormous. In India, people are very much hesitant to try something new to eat. What do you do to stay abreast about the new trends in culinary world? I love reading books and I am very much addicted to net surfing and do have lots of friends from the same profession who all are working across the globe. We do exchange our thoughts and work with each other and this way I keep myself updated with latest trends in the culinary world. I feel living a healthy life style is catching up fast and thus, healthy eating that includes using indigenous products & environmental sustainability products, fresh, gluten free cuisines, sustainable seafood, non wheat noodle and pasta etc are becoming common. You have prepared food for the leading Italian soccer club and for launch F1 season. What all challenges you have faced in feeding them? It was great fun in serving the soccer players and the F1 drivers and they follow strict diet. Their disciplined lifestyle is a great lesson in itself. Their requirement is very specific in terms of quantity and quality. There wasn’t anything you could do with their food since they didn’t deviate from their diet. So, it was easy to cook for them. What is your speciality when you have the global gastronomic experience? I specialise in European and Asian cuisine. What is your role as the Executive Chef at the Lalit Great Eastern? As an Executive Chef, I concentrate on training and development of my team members in terms of skill and knowledge. I try and constantly update myself and my colleagues with the trends in the world cuisine by emphasising on the quality of product, skilled cooking techniques and an appealing presentation. How do you maintain quality, consistency and food safety while designing a menu? The key word for any menu engineering is standardisation of recipe and menu specification. If these few things are taken care of in initial stage of menu drafting, quality, consistency and food safety will be maintained. Any advice for the new comers in the industry? This profession demands a lot of time and hard work and off course one should have an aptitude for cooking. Future of Vocational Education in India..
Top Emerging eLearning Trends in K-12 Education..